Sunday, the final day of the Hempel World Cup in Maimi, will see five final medal races, for the Finn, Laser, Radial and the two 470 events. 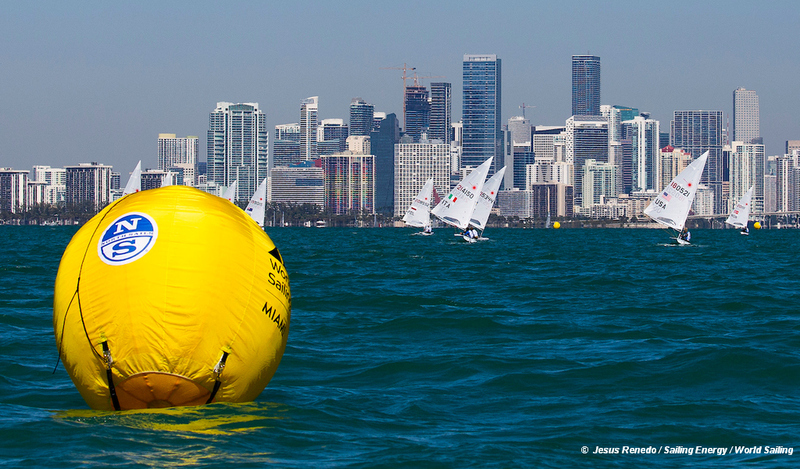 After the completion of their series racing these final medal races will close the 2019 Miami World Cup. In the women’s 470 Hannah Mills and Eilidha Mcintyre will be going for gold, but it will not be easy. Germany’s Frederike Loewe and Anna Markfort lead by three points, and Fabienne Oster and Anastasiya Winkel are just a point behind the Brits. Plus Fernanda Oliveira and Ana Luiza Barbachan of Brazil could also spoil the party. In the mens 470 it’s a close battle between Anton Dahlberg and Fredrik Bergström of Sweden and Jordi Xammar and Nicolás Rodríguez of Spain for the gold. In the Radial, Dongshuang Zhang of China looks set for gold, with Paige Railey USA having a remarkable regatta looking for silver, and Vasileia Karachaliou the bronze. Alison Young is in fourth, but the points look to be against her making the podium. Britain’s Lorenzo Chiavarini got himself into the Laser medal race, with a great final day effort, but is outside of a podium chance. Hermann Tomasgaard of Norway has already wrapped-up the Laser gold with a 65 point lead. Closer finish expected in the Finn, where Sweden’s Max Salminen has a four point lead ahead of Jonathan Lobert of France, plus another four could be battling for the bronze. The leaderboard positions for the Medal races . . . Provisional.